Does Running Hills Flatten Your Stomach? When you're slogging your way up a long hill, it helps to give yourself a little reminder about why you're putting yourself through this ordeal. It may be helpful to remember that running uphill not only increases your aerobic fitness, but it alsos help you in your quest to get a flatter abdominal area. If your stomach area is bulkier than you'd like it to be, it's likely due to excess fat. To lose fat, you have to do exercises that burn calories and reduce overall body fat. Since running definitely does burn the calories necessary for losing weight, running in general -- and certainly running uphill -- will help you slim down your waist. However, it's important to remember that losing fat requires a calorie deficit, meaning you also need to burn more calories than you consume. Running burns calories, but running uphill will help you burn them even faster because it requires you to push your body upward against gravity in order to keep going. It's difficult to say exactly how many calories you'll burn, since the number depends on your weight and intensity level. A 155-pound person running at a pace of 5 miles per hour will burn roughly 298 calories during a 30-minute session. For every 1 percent increase in incline, you increase your calorie burn by 4 percent, suggests personal trainer Davey Wavey. So running on a hill with 5 percent grade and at the same level of intensity the same 155-pound person would burn about 59 more calories than when running a route with no hills -- that is, if she ran the entire 30 minutes on an uphill grade. Running on an incline for the duration of your workout is possible when you're using a treadmill, but less feasible when you run outside. When you're outdoors, that uphill is likely to have a downhill component as well. While you'll burn fewer calories on the downhill, there's another benefit that will help you in your quest to flatten your stomach: Running downhill recruits the muscles of the lower abdominals, reminds "Shape" magazine. That means you'll get some muscle-building benefits, along with aerobic benefits. Armed with the knowledge that burning calories is the way to lose fat, you may be tempted to go out there and run as many hills as you can find. While that will help your cause, it's important to balance that intensity with the amount of time you spend running. 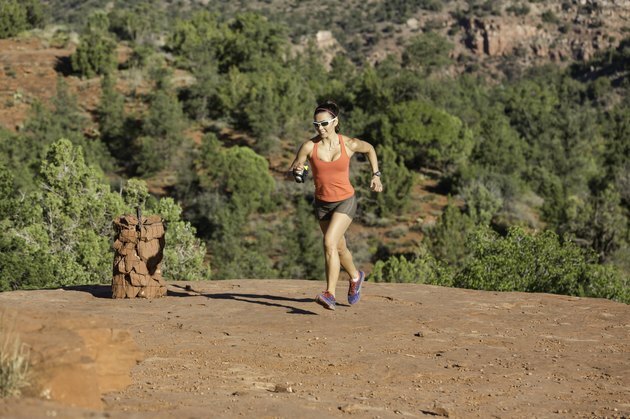 Running a few hard hills is going to make you pretty tired -- which may mean you'll make your run shorter than you would if you hit fewer hills. How Fast Am I Going if I Ran at 5.0 on a Treadmill for One Mile?